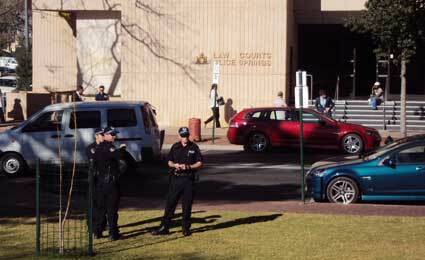 A murder trial in Alice Springs holds up a mirror to the town’s dealings with issues of race, and the inter-racial dynamics turn out to be not nearly as clearcut as might be expected, writes KIERAN FINNANE in Inside Story. With its romantic image of the hardy frontier town becoming an uneasy memory, Alice Springs is now widely cast as a place of Aboriginal disadvantage and dysfunction. But might it be more useful to understand Alice as a place constantly being remade by multifaceted encounters between cultures and their histories? In the trial in 2011 of two Aboriginal men, Graham Woods Junior and Julian Williams, accused over the death of a white man, Ed Hargrave, a picture emerges of the town’s interracial dynamics. They are not nearly as clearcut as might be supposed: we see some of the prejudices and sensitivities, some of the systemic biases and divisions, some of the aspirations and the connections – not only between individuals, but also within the justice system, the administration, in local media, in workplaces, leisure places and public places. Inside Story is an online journal published by the Swinburne Institute for Social Research. Finnane’s story (a long read) is here.